Lowdown: Tarantino does a spaghetti western. What it is that makes a movie into a Tarantino movie? I propose several answers. 1. Lots of nonsense talking, including potentially wasteful ones lasting way longer than other movies would allow (for the sake of flow). Exaggeration can take even more exaggerated form, like one character saying something, the other one being hard at hearing, and the first character repeating what the audience has already heard pretty clearly; it's rare for movies to implement such narrative tools. It takes much confidence. 2. Unnecessary levels of violence and gore. Perhaps unnecessary is the wrong word, since gore is the more realistic result of someone being shot in the head; it's just that other movies block such views from us while Tarantino celebrates them. Yet, it has to be said, he does so in a clearly artificial manner; a blown head contains more than just rivers of red fluid. I can only conclude that it is this artificial celebration of gore that is the actual Tarantino trademark. 3. The reintroduction of familiar movie stars whose stardom had waned over the years for no particular reason whereas their acting skills are quite fine, thank you. 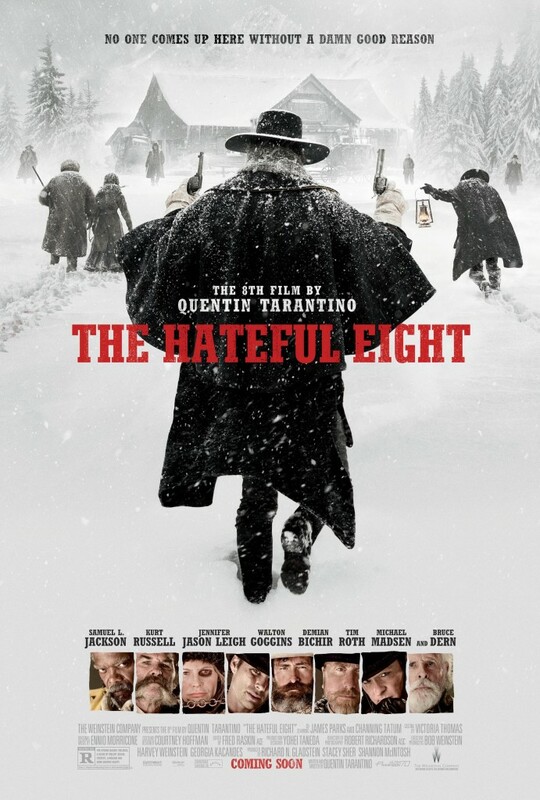 The Hateful Eight, Tarantino's latest, ticks all of the above (and more). I guess Tarantino & Co had a lot of fun making his version of a spaghetti western; the inclusion of so many familiar Tarantino faces hints at that (Samuel Jackson, Tim Roth, Michael Madsen - to name a few). Then there are the new old faces, like Jennifer Jason Leigh, who - in my view - is the best thing to happen to this movie, which raises the question "where has she been all these years". The story rings Tarantino, too (including the math that never really works up to eight). Two bounty hunters (Kurt Russell and Jackson) meet up and, given a pending snow storm, seek shelter at a remote cabin. As it happens, another coach sought shelter there just ahead of them. Jackson's character can notice some signs of malice at hand, but regardless all have to now to stick it out together in said cabin for the duration of the storm. I shall put it this way: not everyone comes out alive. Everyone's a bad guy in this very Tarantino story. I was unable to find any particularly meaningful messages here, but there are running themes involving the usual racial tensions America has been blessed with. Overall: Not Tarantino's best, but a classic Tarantino nevertheless. 3.5 out of 5 blood red crabs.